*My "reviews" of manga are a combination of a summary and a review. It's hard for me to really talk about a volume of manga without going in depth with the plot. So if you're really concerned about spoilers, beware. Volume 13 gives us yet another reason to feel bad for Yuki. His mother shows up to his parent-teacher conference. She may not be cursed as a Zodiac, but she's definitely a real witch. Her treatment of Yuki in front of his teacher is beyond cruel. Luckily, Ayame, Yuki's outlandish brother arrives to save the day. Yuki survives the parent teacher conference only to get stuck in another awful student council meetings. Yuki just can't get a break. Uo-chan has been pining over her mystery suitor for months now. She mentions that his name is Kureno and Tohru wonders if he is Kureno Sohma, Akito's trusted assistant. Kureno lives far inside the Sohma compound. 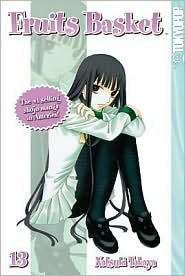 Even though it is dangerous for Tohru to go so close to Akito, she is determined to confront Kureno. On the way, she runs into Momo, Momiji's sister. The poor little girl adores her brother but has been kept away by their mother. Momiji's status as a cursed zodiac member makes him persona non grata within his own family. It is just another instance of where even the nicest Sohma family members are treated horribly. It truly is a curse. Tohru is more and more determined to break it. It turns out that Kureno Sohma is Uo-chan's mystery man. He comes off as unapproachable and reluctant to involve himself with Uo-chan again. But you can tell that he admires Tohru's courage to speak to him. I really do like Tohru's character development. She seems like such a good-two-shoes - a weak, overly nice girl who lives only to please others. That's true to an extent, but she also is bound and determined to get what she wants. She's a selfless creature, so hePublish Postr wants invariably benefit others. I admire her tenacity and her strength. The volume ends with a class visit to Kyoto. I think the also go to Nara, because deer are coming up to them trying to get food. It was fun to go to places in a book that I visited in person last year! I loved the deer in Nara - they roam free and will headbutt you for food. How many volumes is a typical manga series? Is it easy to keep up with them? That's so cool that you were able to travel to the places mentioned in the book, that always makes for a more interesting read:) Even though I don't read manga, I always like reading your reviews of them! Great review and a great series! Have you seen the anime? Hi there! I'm just going through my dashboard and visiting all the blogs I follow. It is hard to review manga volumes! I like Tohru's character arc. I was worried at first when the series began that what we saw of Tohru was was we were going to get the entire series, but the changes in her character and the other characters were fantastic!!! Re: Knightley Academy/Secret Prince: Alison- I don't actually know what MG stands for. Does it stand for multi-generational? If it does, then, yes. Knightley Academy is totally a series that is fun for all ages! It's a great juvi series and reads similar to Harry Potter. I haven't met anyone who hasn't enjoyed it yet!